On November 8, Rossiya Segodnya will announce the Grand Prix winner in the Andrei Stenin International Press Photo Contest. The organizers will keep the name of the winner secret until the last moment and will only reveal it at the awards ceremony which will take place in the Exhibition Complex of the State Historical Museum at 2/3 Revolution Square. The ceremony will be followed by an exhibition of the winners’ works. It will be open for visitors during normal museum working hours until January 14. Admission is free. In 2018, 25 young photographers from 14 countries competed for the Grand Prix. Among them were photographers from Russia, Iraq, Iran, Spain, Italy, Belarus, Israel, South Africa and others. The exhibition will feature some 200 works by the best young photojournalists who try to capture all the complexity of life in their images — from the Biblical beauty of limestone quarries in Upper Egypt to the fast cutting of post&dash;election events in Kenya in the fall of 2017, from the ethnic rites of Nenets nomads in the Arctic to the heated tennis matches of the 2017 French Open. The State Historical Museum Exhibition Complex will be the first venue for the winners’ exhibition. The photo show will then go on tour at galleries around the world. The Andrei Stenin International Press Photo Contest was launched by Rossiya Segodnya under the aegis of the Russian Commission for UNESCO. Its main goal is to support young photographers and draw public attention to the challenges of modern photojournalism. This contest is a platform for young photographers; talented, empathetic and open&dash;minded, they draw our attention to people and events around us. 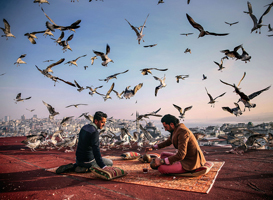 In 2018, the contest jury included representatives from the world’s leading news agencies: AFP (France), Anadolu Ajansi (Turkey), Notimex (Mexico), as well as world&dash;class photographers and editors. The jury was chaired by Ahmet Sel, who is Visual News Editor in Chief for Anadolu Agency (Turkey). string(168) "Себнем Коскун. Турция. Завтрак на привале. Моя Планета, одиночные фотографии, особая отметка"
string(185) "Федор Телков. Россия. Уральские марийцы. Народный костюм. Портрет. Герой нашего времени, серии, 3 место"
string(132) "Шива Хадеми. Иран. Близнецы. Портрет. Герой нашего времени, серии, 1 место "
string(154) "Сергей Гапон. Беларусь. Клюквенное сердце. Моя Планета, одиночные фотографии, 1 место"
string(174) "Одид Вагенштайн. Израиль. Цветочек. Портрет. Герой нашего времени, одиночные фотографии, 1 место"
string(135) "Виталий Невар. Россия. Затмение. Моя Планета, одиночные фотографии, 3 место"
string(152) "Мария Плотникова. Россия. Красная корова. Моя Планета, одиночные фотографии, 2 место"
string(105) "Анас Камаль. Египет. Белая гора. Моя Планета, серии, 3 место"
string(116) "Алена Кочеткова. Россия. Как я болела. Моя Планета, серии, 1 место"
string(172) "Алексей Филиппов. Россия. Вратарь. Портрет. Герой нашего времени, одиночные фотографии, 3 место"
string(76) "Shiva Khademi. Iran. Gemini. Portrait. A Hero of Our Time, series, 1st place"
string(71) "Alyona Kochetkova. Russia. How I fell ill. My Planet, series, 1st place"
string(68) "Sergei Gapon. Belarus. Cranberry heart. My Planet, single, 1st place"
string(82) "Oded Wagenstein, Israel. Rosebud. Portrait. A Hero of Our Time, single,  1st place"
string(63) "Maria Plotnikova. Russia. Red cow. My Planet, single, 2nd place"
string(85) "Alexei Filippov. Russia. Goal keeper. Portrait. A Hero of Our Time, single, 3rd place"
string(59) "Vitaly Nevar. Russia. Eclipse. My Planet, single, 3rd place"
string(91) "Sebnem Coskun. Turkey. History on the Road Breakfast. My Planet, single, honorable mentions"
string(67) "Anas Kamal. Egypt. The White Mountain. My Planet, series, 3rd place"
string(132) "Fyodor Telkov. Russia. Russia. Marii El dwellers in the Ural region wear folk suits. Portrait. A Hero of Our Time, series, 3rd place"